David Kaplan unloads cots for Jaycee Towers residents at the South Chattanooga Recreation Center. Residents of Jaycee Towers spent a second night away from home Tuesday while an EPB crew was expected to work through the night to finish replacing a transformer that caused a mechanical fire on Monday. But the completion of EPB's work is not expected to end a situation reminiscent of last summer's saga at Patten Towers -- a similar building less than a mile away -- that kept elderly and disabled residents away from their apartments for close to four weeks. Once EPB's work is complete and the power is restored, Chattanooga Fire Marshal Beau Matlock said more will have to be done before he considers Jaycee Towers safe for people to return, according to a Chattanooga Fire Department news release. The fire department conducted a fire and life safety inspection of the building Tuesday, but won't be able to verify that the alarm system and emergency lights are working until power is fully restored, fire department officials said. The building's sprinkler system is fully operational, Matlock said. "We're hopeful that the residents can return to their homes at Jaycee Towers within the original completion estimate of 72 hours," Matlock said in the release. That time frame would mean residents would return to the building about noon Thursday if no unforeseen problems cause further delays. On Monday night 72 of those displaced by the fire stayed at the South Chattanooga Recreation Center where the Southeast Tennessee chapter of the Red Cross crews set up an emergency shelter. Emily Fish, an emergency services specialist with the Red Cross, said that 65 were expected to spend the night there Tuesday. Cots stretched across the gym floor at the community center while some Towers residents mulled about, wondering when they will be allowed back in their apartments. Goodwill provided clothing for those needing it and the Salvation Army continued to provide food to those at the shelter. Fish said they are prepared to continue providing for those who have been displaced until a solution is reached. "We'll rock and roll until then," she said. Chattanooga Mayor Andy Berke, his Chief Operating Officer Jeff Cannon and City Councilman Chris Anderson visited the shelter Tuesday morning to lend support. "I faced this almost a year ago now with Patten Towers and we know it's a difficult situation with residents moving to our Youth and Family Development Centers," Berke said later by phone. "I wanted to go down there and make sure they knew we were concerned about them, wanted to make them comfortable and that we're working with EPB and the owner to get them back in their apartments as soon as possible." EPB spokesman Wendell Boring said the cause of the fire is still under investigation. The old transformer is under examination. An electrical contractor came in to repair subsequent damage to some of the building's wiring caused by the mechanical fire. Power to parts of the building could be turned on, which allowed crews to use an elevator to lug the new 2,500-pound transformer to the eighth floor. But crews could not keep the power on while repairs continued. "We obviously hate when things like this happen and we are very empathetic with the people involved because this is disrupting their lives and we hate that," Boring said. "We pride ourselves on customer service and sometimes things happen beyond your control and when those things do happen we strive to get them repaired as quickly as possible." 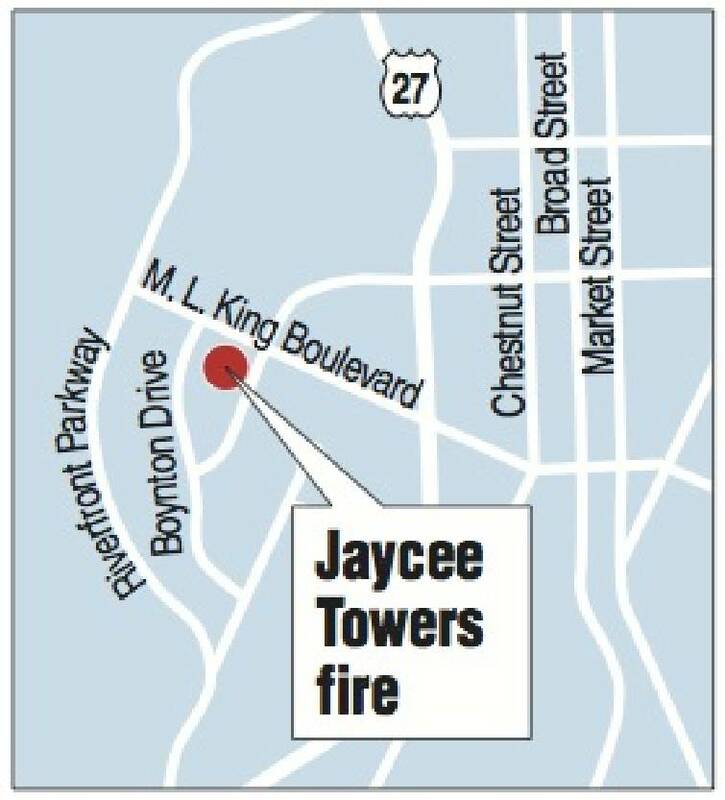 Several calls to Lookout Property Management, which owns Jaycee Towers, were not returned Tuesday afternoon.